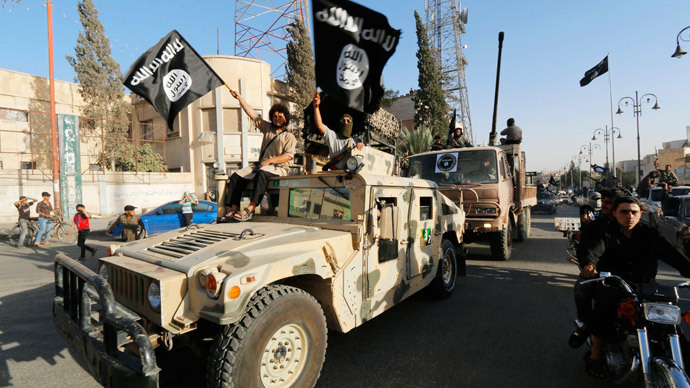 The Islamic State must expand “in order to maintain its financial management and expenditures in areas where it operates,” international investigators with the Financial Action Task Force said, explaining the group’s projected strategy. Without doing so, the terrorists could not be certain how long they could keep up their current levels of spending, the Paris-based investigation revealed. The FATF is comprised of government officials from across the world and is tasked with investigating money laundering. The group supported the assertion that ISIS (Islamic State) has been branching out into all sorts of activity, including the seizure of resources like oil fields, extortion, theft and other criminal ventures. The investigators came to the conclusion that ISIS is a special breed of terrorist organization where funding “is central and critical to its activities,” with proceeds from occupied territories being their primary source of revenue. Aside from this, the FATF says abuse of NGOs and charities by terrorist donors is also commonplace. Kidnapping for ransom and cash smuggling are other sources. The investigation also found the ISIS has been making good use of crowdfunding and other internet-related sources of gathering support. According to US officials, the militants started imposing taxes on all kinds of economic activity in the city of Mosul, northern Iraq, even before it was seized by them in June. They threatened to kill those who were reluctant to pay. From Mosul alone, Islamic State was reaping $8 million a month from extortion, another analysis by the Council on Foreign Relations said. When the group seized the city, it grabbed millions of dollars in cash from banks. But the overwhelming dependence on oil business and looting leaves the Islamic State vulnerable and, therefore, “cutting off these vast revenue streams is both a challenge and opportunity for the global community to defeat this terrorist organization,” it says in the report, which goes on to give a surface review of the Islamic State’s conquests in the oil field and reservoir category. FATF also believes the coalition airstrikes and the huge slump in oil prices have proven beneficial in “significantly [diminishing]” ISIS earnings with respect to extracting, refining and selling oil. Included in this is the terrorist group’s own reliance on the resource. The next logical step in stepping up the fight against ISIS is to identify the financial and resource channels, the “middlemen, buyers, carriers, traders and routes” the terrorists use to traffic captured resources, FATF said.